Although it's still the only month without a $30 million opener, October has still been the unofficial launching point for the holiday film season, at least since 2000. It's been subject to the same spillover of potential blockbusters that has expanded the summer season into early May and late April. The current October record holder, Meet the Parents, at $28.6 million, is sure to fall this weekend. Red Dragon, the latest film from the Hannibal Lecter series, is set to follow last February's Hannibal in shattering a monthly record. Still, it's an unusual placing as this is the first franchise film to open in October since Never Say Never Again. After Hannibal opened to $58 million last February, Universal had to think for, oh, about five seconds as to whether they wanted to green-light a film based on the other Thomas Harris novel they had the rights to, Red Dragon. Of course, it's already been filmed before as 1986's Manhunter, but in a world where Britney Spears can remake a Rolling Stones tune, surely we can deal with Brett Ratner remaking a Michael Mann film, right? You certainly can't blame them for thinking they could surpass the earning for the previous film, as when Manhunter was released, Hannibal Lecter was nothing of the iconic figure that he's become; the William Petersen/Brian Cox pairing only managed to take the film to $8.6 million total, which wasn't even the popcorn sales for Hannibal's first weekend. Red Dragon marks Anthony Hopkins' third turn as Hannibal Lecter, although as a prequel, it presents the thoroughly odd situation of the 65-year-old Hopkins portraying himself as ten years younger than he was in Silence of the Lambs eleven years ago. Got that? Fine, let's move on. Edward Norton and Ralph Fiennes are significant upgrades (at least in the "name actor" department) over William Petersen and Tom Noonan, respectively, but let's face it, it's Hopkins that makes this film what it is. Even though Hopkins is not the antagonist of this film, you sure wouldn't know it from the commercials for the film, which practically have him jumping out of the shadows and yelling, "Boo!" Obviously the baseline for comparison is Hannibal's record-breaking total (it's also the R-rated record). A couple of things make me think that it's not up to surpassing that figure. 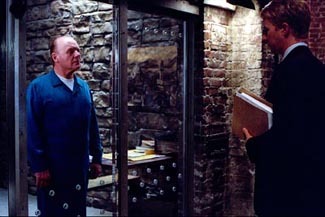 For one, Hannibal had the unique marketing angle of being released ten years to the week after The Silence of the Lambs, something that Red Dragon just can't capitalize on. As well, those that saw Hannibal, the natural audience for Red Dragon, didn't all describe the experience as enjoyable, giving it a C+ overall CinemaScore. Much of that was due to the novel itself, a problem that Red Dragon doesn't have, but could still deter some of the walk-up crowd. Another ultra-wide release, Red Dragon should be able to manage about $49 million in this frame. Also opening wide is Jonah: A VeggieTales movie, which should combine with Red Dragon to be the two opening films with the least crossover competition in the history of cinema. In the past few years, producers of animation have discovered that you didn't have to be limited to TV and video releases and many have carved out small niches with feature-length releases. VeggieTales is somewhat unique in that it presents Bible stories as acted out by computer-animated talking vegetables. No, I don't really get it either, but the video series has been quite popular, selling over 20 million copies in seven years. This is spread out over 59 videos that I can see (at least), so the potential audience is not quite as large as that number would seem to indicate. I'm reminded here of Barney the Dinosaur, which was a national kiddie phenomenon but earned just $12 million in its theatrical release of Barney's Great Adventure, which was copied almost to the dollar by The Adventures of Elmo in Grouchland. If Sesame Street can't break a $4 million opening, I'm not willing to grant too much hope to VeggieTales. On what's termed a "national" release of about 900 venues, VeggieTales will definitely open below $5 million, and maybe below $3 million. The current September opening-weekend record holder is last week's number one and this week's number two. Sweet Home Alabama was nothing less than the coronation of Reese Witherspoon as the latest Hollywood rom-com princess; I'll pause while half of you fawn and the other half gag. Romantic comedies in general tend to be pretty resistant to the type of drops that have befallen some of the bigger films of the past few years. Even Runaway Bride, which had rather indifferent word-of-mouth, was able to pull together drops of under 35%, after a 40% fall in its second weekend. Sweet Home Alabama should be able to duplicate this kind of behavior; a second weekend above $20 million seems very likely. Here is the spot where I would normally talk about The Tuxedo. However, seeing as this is the most phenomenally terrible film that Jackie Chan has ever made, in English or in Chinese, I'll not discuss it further. It will depress me if this "film" makes more than $7 million this weekend. My mental health is in your hands, moviegoers! Do your part! Although the amazing story of the fall has been, and continues to be, the astounding run of My Big Fat Greek Wedding, its status has been challenged in the past few weeks by the impressive performance of Barbershop. Clearly this was more akin to Ice Cube's Friday series that was expected; its $20.6 million opening weekend on just 1,605 screens took many by surprise. What is perhaps a greater surprise is that after three weeks, its weekend tally is still above $10 million. It's added about 500 venues since opening weekend; after adding a little over 150 last weekend, it dropped just 22%. Its run is not without controversy; last week a group of black protesters lead by Jesse Jackson asked that a joke about Rosa Parks be removed from the film. However, instead of a grassroots boycott developing, what this seemed to do was cause people to think, "Hey, that's a funny joke. I'm gonna see that movie!" The producers are probably scrambling to find something else in the film to have them protest about. I don't expect its good fortune to continue too much longer, but a $7 million weekend would be an excellent showing for this film's fourth week. It appears headed for a $75 million total gross. The aforementioned My Big Fat Greek Wedding continues to stymie all attempts at extrapolation after spending its sixth week in the top four. It's down a whole 7.3% from its opening weekend per-venue average, which was in limited release and is almost universally greatly inflated. It lost screens for the first time since its release...OK, just a dozen, and this still only caused a 3% drop in earnings. At one point, $100 million seemed like a pie-in-the-sky estimation. Now it's very close to passing $150 million (it should happen mid-next week, or at latest next weekend) and $200 million looks like a possibility. Stop and think about that for a second. When's it going to run out of steam? Your guess is as good as mine. It was still selling out shows this week at the theater I patronize, so obviously they're not going to let it go any time soon. Another $9 million again this weekend sounds about right. The two limited-release films that are making the most noise right now, Spirited Away and Moonlight Mile, both continue their expansion plans this weekend. Spirited Away's move is more modest, jumping from 53 to about 80, while Moonlight Mile flirts with wide release at around 400 venues. Spirited Away was able to maintain an impressive $10,000 per-venue average, as compared to $17,000 the weekend before; the 40% drop is less than might be expected for a film that about doubled its screens. As this weekend's increase is not as great a relative increase, I expect it to hold more of its average, earning about $700,000. Moonlight Mile, on the other hand, has the top ten in mind and should be able to get it. This uplifting weeper (if there is such a thing) should grab about $3-4 million, which in the weak lower half of the box office charts could place it as high as sixth. A third expanding film, Secretary, which stars Maggie Gyllenhaal, the sister of Moonlight Mile's Jake Gyllenhaal, also has eyes on the top ten. It will likely fall just shy of the top run, earning between $1 and $2 million with its story about sexual politics in the workplace.